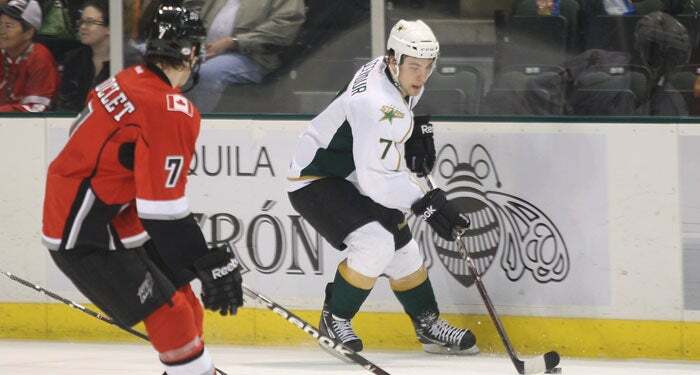 Texas Travels to Oklahoma City on Friday, March 23rd at 7:00 p.m.
Cedar Park, TX - The Texas Stars (27-33-2-2, 58 points) were defeated by the Abbotsford Heat (34-25-3-4, 75 points) 5-2 at the Cedar Park Center on Monday night. Left wing Ryan Howse registered two goals for Abbotsford, including the game-winner at 5:04 of the second period. Right wing Andy Brandt notched a goal and an assist while center Ben Walter and defenseman Joe Piskula each added two assists. Forwards Adam Estoclet and Dustin Sylvester also scored as the Heat finished the season 6-2-0-0 against the Stars. Abbotsford goalie Leland Irving (19-12-1) stopped 22 shots, taking the team’s road record to 22-11-0-3. Stars right wing Colton Sceviour put up both goals for the home team.Texas goalie Tyler Beskorowany (10-18-0) stopped 26 shots in the loss. Texas travels to Oklahoma City on Friday, March 23rd at 7:30 p.m. The Stars got on the board late in the first period with a penalty shot from right wing Colton Sceviour. Sceviour’s 18th tally of the season went in with 2:10 remaining in the period and gave Texas a 1-0 lead. The Heat tied the game 1-1 in the second period with a goal from center Dustin Sylvester. Sylvester found the back of the net with help from right wing Akim Aliu and defenseman Brian Connelly just 40 seconds into the second frame. Abbotsford jumped out to a 2-1 lead at 5:04. Left wing Ryan Howse beat Texas goalie Tyler Beskorowany with assists from defenseman Clay Wilson and center Ben Walter. The Heat continued the scoring, generating a 3-1 lead with 6:44 left in the period. Center Adam Estoclet snapped a wrist shot in for his fifth goal of the year. Walter and defenseman Joe Piskula each added an assist on the club’s third goal of the night. The Stars cut into the Heat’s lead with 3:03 remaining. Right wing Colton Sceviour netted his second goal of the night as he poked the puck past Abbotsford goalie Leland Irving. Left wing Francis Wathier and center Scott Glennie each provided an assist on the tally that made it 3-2. Abbotsford strengthened its lead at 2:09 of the third period. Left wing Ryan Howse notched his second goal of the night, giving the Heat a 4-2 edge. Defenseman Joe Piskula and right wing Andy Brandt each supplied an assist. The Heat struck again with 6:03 to go in the final frame. Brandt tapped in his first goal of the season for the 5-2 lead. Forwards Carter Bancks and Pierre-Luc Letourneau-Leblond set up the play. Texas starts a three-game road trip on Friday, March 23rd at Oklahoma City at 7:00 p.m. The Stars then travel to Toronto for a 2:00 p.m. faceoff against the Marlies on Sunday, March 25th. The trip concludes on Tuesday, March 27th at 6:00 p.m. against the Lake Erie Monsters. Texas returns home to face the Hamilton Bulldogs on Thursday, March 29th at 7:30 p.m. Thursday’s game is a 3-2-1 night, featuring $3 domestic drafts, $2 sodas, and $1 hot dogs. Individual tickets for all games are on sale now. Tickets are available online at www.TexasStarsHockey.com or by calling 512.GO.STARS (467.8277). 2012-13 season seat packages are on sale now. For more information on Texas Stars season tickets call (512) GO-STARS (467-8277) or visit www.TexasStarsHockey.com. Anyone interested in purchasing season tickets, suites, group tickets or mini-plans may call the Texas Stars front office.